Russian President Vladimir Putin has said that he will completely understand if Russia loses the right to host the 2018 World Cup should some evidence of bribery be uncovered in the current FBI investigation on FIFA. Speaking to a heaving press conference the Mr Putin said “We will of course launch a full investigation into FIFA and ourselves, should it turn our that our bid was the slightest bit iffy we’ll happily relinquish the tournament. We won’t be the slightest bitter about it. It’s only fair. After all it’s only a game.” He told us. “In fact” Putin continued, “we might just give it to another country anyway. Were we to go ahead with hosting a world cup run by a corrupt organisation, our cup would be tarnished with the bitter stain of deceit. And people would stop calling me honest Putin. The revelations come as Sepp Blatter has announced his preferred successor. Known as Little Sepp Blatter and already the favourite to win, he is thought to be the size of a glove and the spitting image of Sepp Blatter himself but much smaller and carefully perched on the end of his arm. 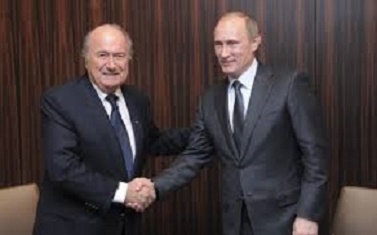 “We don’t like bribery or corruption do we Little Sepp? But if it happens then it’s not our fault is it Little Sepp?” He explained.